Only high-grade packaging material has been used for the safe packing of the products. Thus, we make sure that our customers will get only damage-free products from our end. We firmly abide with our terms and agreements in regards of Payment and its Time Schedule. Our payment methods are practical and simple. We provide multiple payment options. 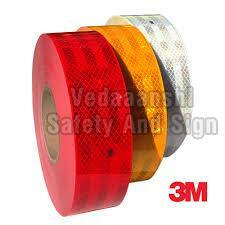 Reflective Tape Application: Truck and Trail, Road, Warning,safety and used for Vehicle Marking approved as per AIS090 and all RTO in India. A marked vehicle is recognized faster than an unmarked vehicle. Increased reaction time for driver to maneuver vehicle to safety. Enhanced assessment of parked and slow moving vehicles from a distance. Fewer accidents and improved safety for people and goods on board.